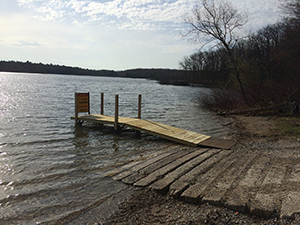 The Lake Dubonnet boating access site located in Green Lake Township in Grand Traverse County, which provides lake access at the Lake Dubonnet State Forest Campground, will temporarily close beginning Monday, Aug. 13, for boat ramp replacement. The site improvement project will include the replacement of the existing deteriorated ramp with a new ramp measuring 18 feet wide by 60 feet long. Construction is expected to last two weeks, with a tentative reopening date of Aug. 24. It is recommended that those planning to visit Lake Dubonnet boating access site check michigan.gov/dnrclosures for any anticipated changes to the reopening date. Additional information on closures and trail detours in DNR facilities, including state trails, boat launches, parks and campgrounds, also are listed on this page. This project is funded through the Michigan State Waterways Fund. The restricted fund, which is derived from boat registration fees and the Michigan marine fuel tax, helps fund the construction, operation and maintenance of public recreational boating facilities. For more information, contact Chris Stark, Interlochen State Park supervisor, at 231-276-9511 or starkc@michigan.gov. Information on additional boating resources is available at michigan.gov/boating. Accompanying photos showing the deteriorating Lake Dubonnet boating access site in Grand Traverse County are available below for download.